What opportunities does technology bring to design and construction today? And what pitfalls? 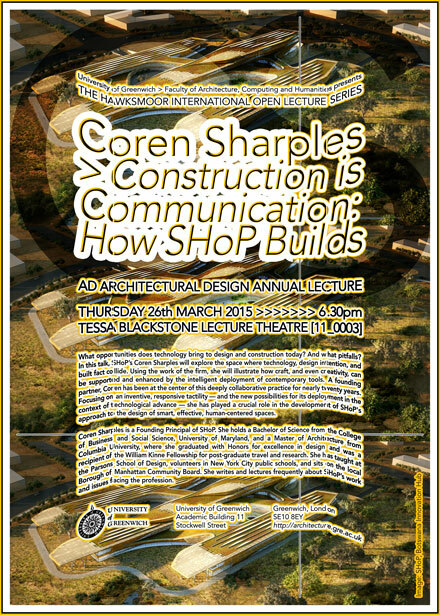 In this talk, SHoP’s Coren Sharples will explore the space where technology, design intention, and built fact collide. Using the work of the firm, she will illustrate how craft, and even creativity, can be supported and enhanced by the intelligent deployment of contemporary tools. A founding partner, Coren has been at the center of this deeply collaborative practice for nearly twenty years. Focusing on an inventive, responsive tactility — and the new possibilities for its deployment in the context of technological advance — she has played a crucial role in the development of SHoP’s approach to the design of smart, effective, human-centered spaces. Coren Sharples is a Founding Principal of SHoP. She holds a Bachelor of Science from the College of Business and Social Science, University of Maryland, and a Master of Architecture from Columbia University, where she graduated with Honors for excellence in design and was a recipient of the William Kinne Fellowship for post-graduate travel and research. She has taught at the Parsons School of Design, volunteers in New York City public schools, and sits on the local Borough of Manhattan Community Board. She writes and lectures frequently about SHoP’s work and issues facing the profession.